August 4, 2011 - FedEx and ORBIS International, a leading global organization dedicated to saving sight worldwide, kicked off a North American Good Will Tour in Los Angeles with the announcement of a new 5-year, $5.375 million commitment in the form of cash and in-kind contributions from FedEx. 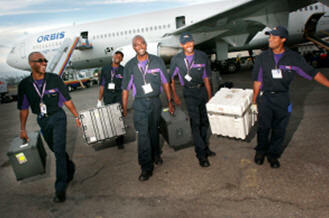 In addition, FedEx Express will donate an MD-10 cargo aircraft to ORBIS to be the third-generation Flying Eye Hospital. After Los Angeles, the Flying Eye Hospital will also visit Burlington, Vt., Dallas Fort/Worth, Memphis, Tenn., and Toronto and Ottawa, Canada between August and November to raise public awareness of the need to eliminate avoidable blindness. ?FedEx has supported ORBIS for almost three decades, one of our longest-running relationships with a nonprofit,? said James R. Parker, executive vice president, FedEx Express air operations. ?We?re taking our work together to the next level by creating the next generation Flying Eye Hospital, which will significantly improve the lives of millions of people around the world who otherwise would have been blind, but now will experience the gift of sight.? The new Flying Eye Hospital, the world?s only airplane with a fully functioning state-of-the-art eye hospital on board, will be built on an MD-10-30 freighter aircraft and will utilize a modular design concept. It is the first time such modular units have been designed for an aircraft, and building them presents an enormous engineering challenge to meet the demanding technical requirements for both aviation and medical certification. MMIC (Mobile Medical International Corporation) of St. Johnsbury, Vt. is under contract to design and manufacture the state-of-the-art modules which will be carried by the MD-10-30 freighter. The Flying Eye Hospital is a unique tool that brings dedicated eye care professionals from across the world to developing countries to provide two to three weeks of training and state of the art surgical demonstrations. ORBIS volunteer doctors impart to local doctors, nurses, biomedical engineers and technicians the skills necessary to provide high-quality eye care to their communities that will prevent and treat avoidable causes of blindness such as cataracts, glaucoma and diabetic retinopathy. Tragically, there are 39 million blind people worldwide; 80% of cases are preventable and treatable. Ninety percent of these people live in developing countries where there is a severe lack of proper medical care. Since 1982, ORBIS has conducted programs in more than 85 countries, impacting more than 15 million lives. ?Preventable blindness can be avoided through routine, inexpensive medical procedures and eye care education,? said Dr. Barbara DeBuono, president and CEO of ORBIS International. ?Through the support of companies like FedEx and the hundreds of doctors, nurses, technicians, engineers, aviation staff and pilots who have dedicated their considerable time and talents we have been able to save sight for millions of people around the world.? FedEx has supported ORBIS for 29 years, almost three decades, providing millions of dollars of support in cash and in-kind contributions. This donation builds on a $5.5 million, five year commitment that FedEx made to ORBIS in 2006. In addition, FedEx and its team members donate the unparalleled FedEx Express global network and aviation expertise to help the Flying Eye Hospital fly. FedEx Express pilots volunteer to fly the current ORBIS DC-10 to many of its medical programs and train other volunteer pilots; FedEx Express mechanics provide maintenance support; team members around the world volunteer as part of the ORBIS humanitarian team as interpreters, welcoming and escorting patients to and from their surgeries and checkups, canvassing neighborhoods and assisting with patient screenings.